French microbiologist Louis Pasteur investigated why fermentation in wine vats produced lactic acid, thereby making the wine go sour. 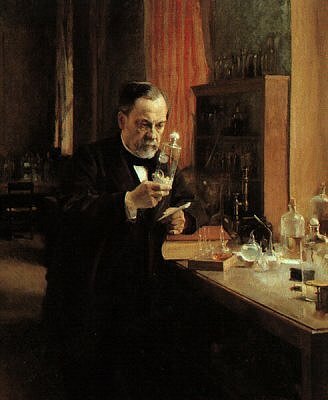 Pasteur concluded (1863) that the fermentation was caused by bacteria in the air. Pasteur's explanation challenged traditional notions of spontaneous generation and lent weight to the germ theory of disease. Pasteur's discovery opened the way to Josoph Lister's revolution in aseptic and antiseptic surgery. In 1879, Pasteur identified the streptococcus bacterium as the cause of puerperal sepsis. Improved hospital hygiene and better infection-control has saved millions of lives. Unfortunately, the quality of Darwinian life preserved in consequence is often mediocre and malaise-ridden.